There are many advantages to using engraved signage such as our range of Traffolyte signs and engraved products. One of the key advantages is the durability of them. Our metallic signs are treated to slow down the corrosion and weathering of the sign. Our Traffolyte signs are essentially made of plastic, something which can take hundreds of years to degrade. These engraving products will last a lifetime before needing to be replaced. Take a look at our extended list of benefits to engraving. We have a range of available materials which can be used for our signage, covering both metal and plastics. 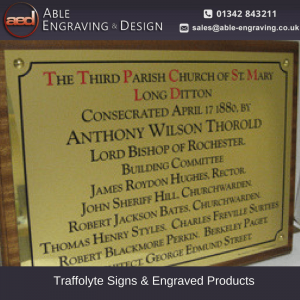 Metal signs are better for commemorative plaques, or signs used in places accessible by the public as they are more visually appealing to visitors. Traffolyte labels and acrylic signs are perfect for safety signs in industrial uses, as they are extremely hard wearing, and can be cut with holes in them to allow pipelines and sockets to pass through, for use, for example, as an identity label, or as a control panel front. Some of our product range include nameplates, safety signs, hand engraving, brass signs and stainless steel signs. All prices for our Traffolyte signs and engraved products can be quoted on request. We treat every job with the highest possible attention to detail and this includes pricing our work in a sensible and competitive way. We have been using the ISO 9002 Quality Control Standards, which mean we can assure the highest possible quality for our engraving products. Give our engraving specialists a call to find out more information about our engraved products on 01342 843211 or email sales@able-engraving.co.uk. Must say I have nothing but good things about Able Engraving fantastic service and very helpful. I have been using Able Engraving and Design’s engraving services for more than ten years now. You can depend on Able Engraving to provide you with the highest quality engraved products at competitive prices and trust them to deliver on time.